Maxim (or Massimo) Gauci was a lithographer who was born in Malta. Little has been written about him, although much of his work survives, scattered in various museums (British Museum, Victoria and Albert, National Portrait Gallery, New York Public Library…). He worked in Paris as a miniaturist in 1808, and then is recorded to have been active in London during the first half of the nineteenth century. His sons, Paul and William, also became artists. 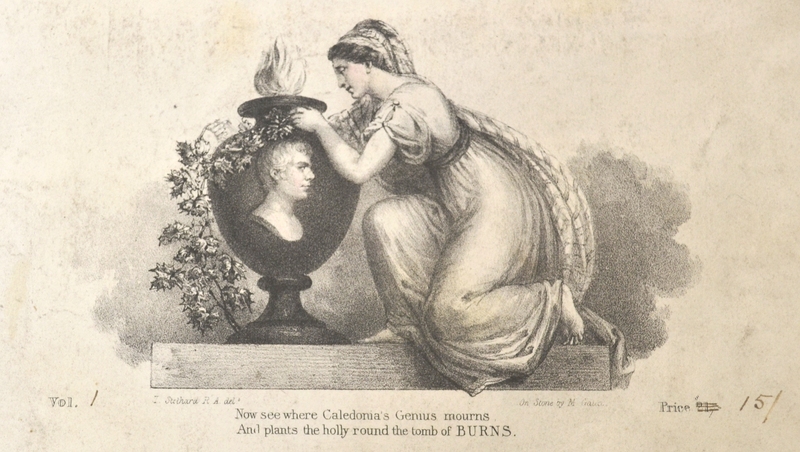 Maxim was particularly well-known for his botanical illustrations, although quite a bit of his work also focused on Scottish and musical material. Thomson may have forged some of his London connections through his collaboration with the music publisher Preston. John Preston began his business in 1774-5 as a musical instrument maker, printer, music seller and publisher. John Preston and subsequently his son Thomas dealt with all of Thomson’s publications from 1793 until the company’s closure in 1834, when they were succeeded by Coventry & Hollier, who published most of Thomson’s later volumes. It is impossible to determine the reasons Thomson had for choosing Preston, but it was no surprise that he veered away from Edinburgh’s music publishers – Corri, Urbani, Gow and Johnson – for all of them were producing rival collections. a true master of the process [of lithography]: his tone ranges from the palest of silver greys to the richest velvet black; his line is never mechanical or obtrusive (The Art of Botanical Illustration, p. 215). Many thanks to Glasgow University History of Art Resource Centre for their help on retrieving information about this artist.